You visit your local eyewear store. You try dozens of frames. Nearly all of them are much too big. There’s only a handful that fit, and you don’t like any of them. Have you had this frustrating experience? You may need petite glasses. Petite glasses are made for small or narrow faces. Their size, shape, and style features are all specially designed to fit and flatter small faces. If you want great-looking glasses that fit you the way they were meant to, read on. Did you know that glasses come in sizes? Most people don’t! Learning what size you need is the first step to looking great in your frames. Then, finding that size is the next challenge. 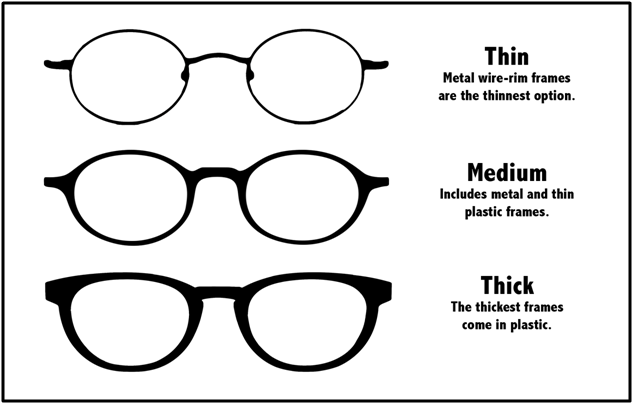 Learn to read glasses sizes here. Discover the size range of petite frames here. Rectangular, oval, and classic cat-eye frames are popular choices for small faces. Square and round frames can work too, but sometimes the lenses are too big vertically. Having a bit less height on the lenses can be nicely proportionate to smaller features. It’s worth noting that changing fashions have an impact on what is collectively considered to “look good.” Five to ten years ago, practically everyone was wearing very short, rectangular glasses because that was very trendy at the time. Now, taller shapes (square, round, taller rectangles) are popular. Stores are carrying fewer short rectangular and oval frames. If you haven’t updated your frames in a while, you may find that the in-store selection (and online, for that matter) is very different than when you bought your last pair. One more reason why it is hard to find glasses for small faces! You can probably pull off a bit more lens height than you did in the past, since it is “the look” of the moment. My current frames have the same width as my old pair, but are nearly double in height! If you are feeling adventurous, you might consider a pair with a few mm more lens height than your old pair. My lens height doubled when I updated my look. I used to prefer plastic because I thought metal frames were boring. Then, I discovered there are plenty of stylish, colorful frames in metal. And because they can be made thinner, they are very flattering on small faces. If you are like me, you may have found that thick frames overwhelm your face. Of course, in my case, most of those frames were too big all around. I was delighted to discover that with the right size, I can pull off a little thickness. You might find the same is true, with correct sizing. Still, many women with small faces find that thinner is better. This makes sense: there is simply less face to distribute the thickness around. That’s why most petite frames are thin to medium. If you want to go really thin, favor metal frames, which come the thinnest. Or, go for thin plastic frames (which will still be thicker than the thinnest metal frames). Also known as half-rim, this style has no material on the lower half of the frame, leaving the lenses exposed. Less rim means less material to swallow up your small face. 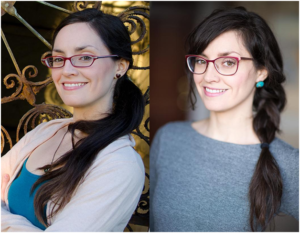 Many people (petite and otherwise) find that black frames make their face look washed out. That’s especially true as we age and lose the coloration of our skin. If this sounds like you, avoid black frames or very dark brown/tortoise. Instead of black, try blue or burgundy. Instead of dark brown, try tan or a lighter tortoise. If your hair is greying, grey or silver frames are very flattering. There is a relationship between color and thickness. It makes sense that thick black frames will be more assertive than thin black frames, simply because there’s so much more of it on the thicker pair. If you like the look of thick glasses, but haven’t been able to make them work, try a dramatic color on a thinner frame. That gives you the bold look you want, without overwhelming your features. A light, bright color that is opaque will look very assertive. For example, opaque white, turquoise, or pink will pop off your face. Colors like this might look best on a thinner frame, just the same as very dark colors. Transparent frames are very popular right now. Or, they can come with varying levels of color, from barely-there whispers of color to deep shades that are halfway between opaque and clear. Transparent frames can be worn thicker since the transparency makes it more subtle in appearance. Also, you have a little more wiggle room on the shape, since the the transparent frame is less assertive than the same frame would be with color.